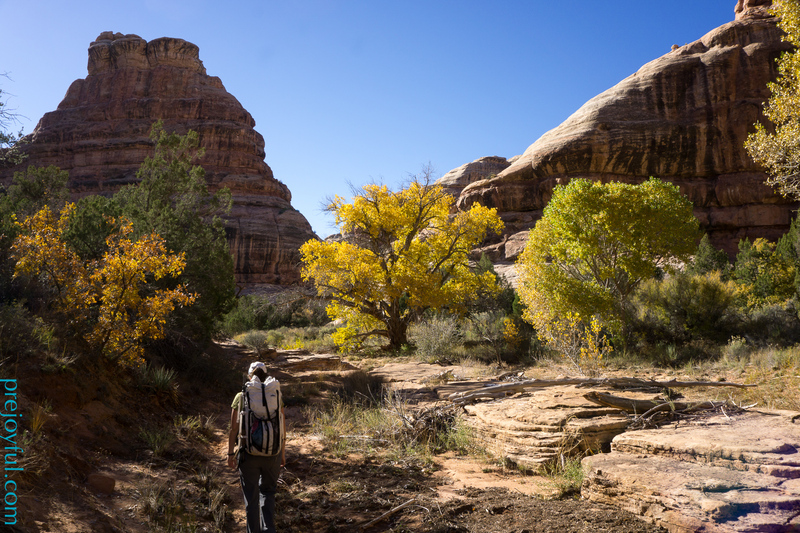 Back in November, we took a tip from our friend Alan to do a trip in Grand Gulch before we left Utah. 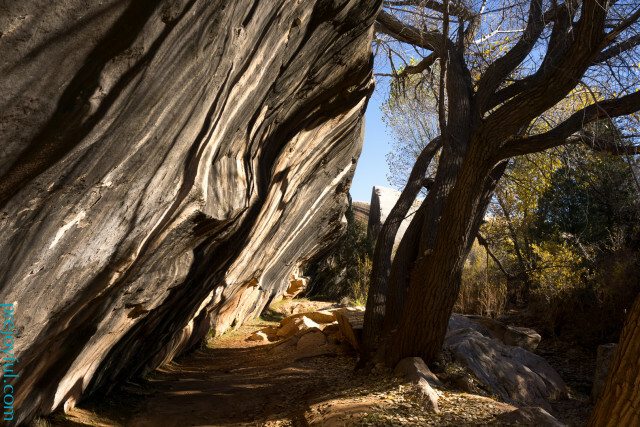 Grand Gulch is a long box canyon, over 50 miles long cutting through Cedar Mesa in Southeast Utah. It is known for its many historic ruins. 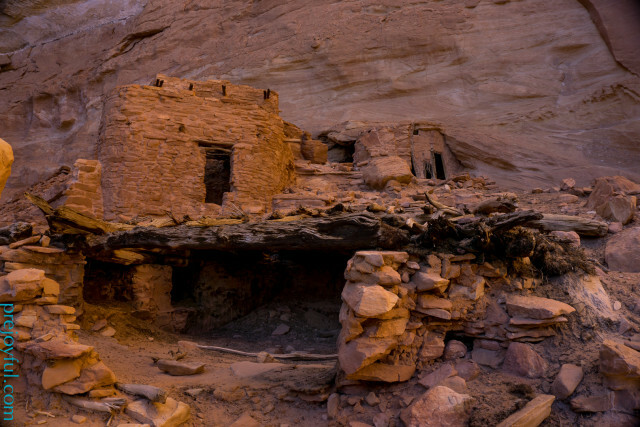 Ancestral Puebloan Native Americans, particularly the Basketmakers, lived in this valley between 800 and 2,000 years ago. 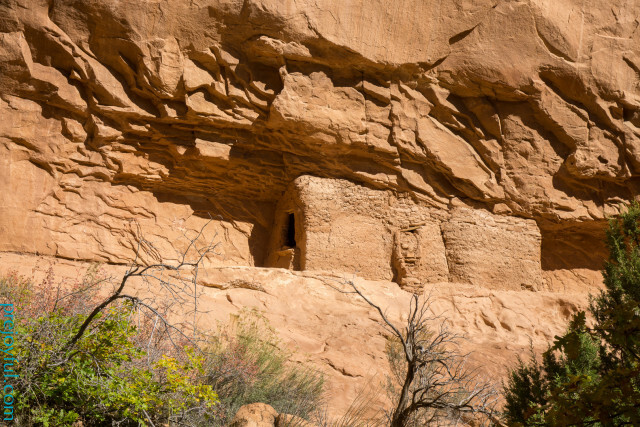 Hikers and explorers will find building ruins and pictographs along the walls of the canyon, flanked by middens full of pottery fragments, grinding stones, and ancient corn husks. Since we planned the trip two days before we hit the trail, we didn’t have time to organize or figure out a shuttle. 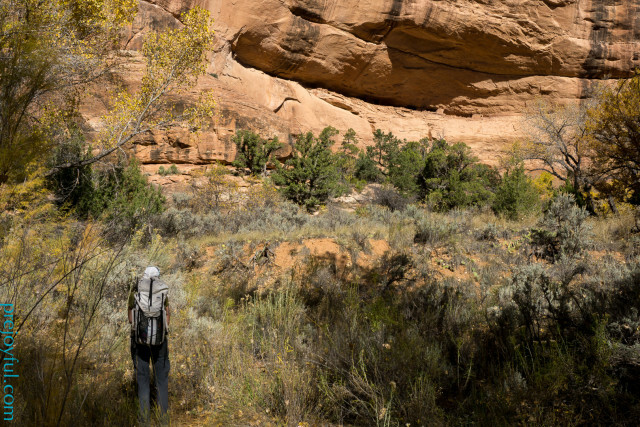 We could have relied on hitchhiking with a more flexible time frame, or stashed our bikes near a convenient trail head, but other shuttle options are likely difficult or impossible in this remote area of Utah. We also had only two nights before we had to head to the Grand Canyon. Given these constraints, Joffrey developed a loop that took us from the Kane Gulch Ranger station, through Grand Gulch to Bullet Canyon, and back out via jeep roads. The plan was for a two night, three day trip with moderate mileages. 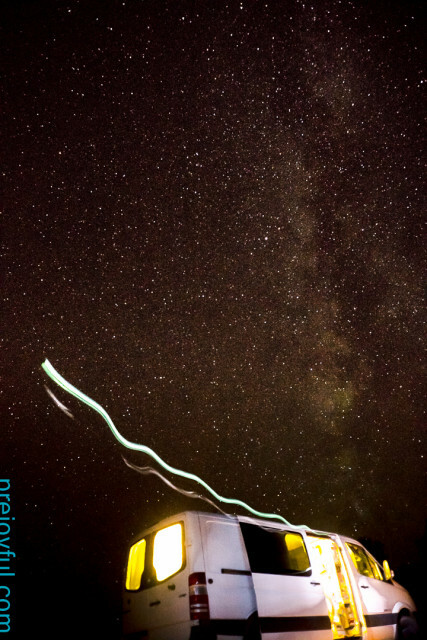 Van-camping below the stars on Cedar Mesa. Our hike started at the Kane Gulch Ranger Station. We began our hike on November 1st. While we knew that Kane Gulch was seasonal, and that we would have to self-issue permits at the start, we thought we’d arrive and talk to a ranger about water sources before starting. What we didn’t realize was that the ranger station actually closes during the winter season. We arrived, first an hour and a half early due to a maladjusted watch (daylight savings is silly), and waited for over two hours for the station to open before realizing our mistake. At least the waiting gave us a chance to read the informational signs about the ancient cultures that thrived in the canyons of Cedar Mesa. 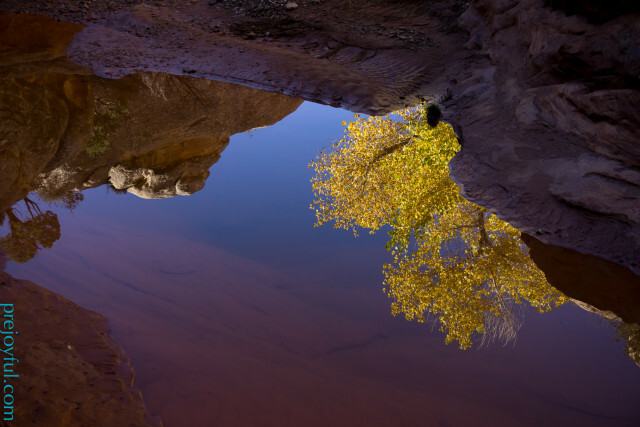 It had recently rained a lot in southern Utah, so we were pretty confident in at least finding water in potholes. We completed the paperwork, and began our walk into Kane Gulch. For the first few miles of our day, we followed the gulch down towards the deeper canyon. There was water everywhere. Plants throughout the gulch were pointing down the canyon, leaning on their sides from when a recent flood had washed everything out. Sand swept over lower banks, and only a few footprints marred the recently flooded wash. Where Kane Gulch meets Grand Gulch, we saw our first ruins, and also found remnants of a trail. Traces of a trail, and ruins in the cliffs above. In many ways, the trail seemed really well established – a deep sandy groove among grasses. Yet, as the creek wound its way through the canyon, the trail would drop off at the creek’s steep edge, and it was almost impossible to find the next section of trail. This led to a lot of bushwhacking through downed trees, brush, and dense canyon grasses. Then, miraculously, we’d stumble across the established trail for a few more minutes before losing it again. The hiking was more prejoyful than we had been led to believe; no worse than other things we have done, but the level of vegetation was not precisely what we expected hiking through a desert. Our goal the first day was to camp at the beginning of Bullet canyon. We ended up taking a lot more time to explore the ruins than we had estimated. The trail travels through the canyon, but with the right maps and the right beta you can figure out where to cut towards the high canyon walls to see the ruins. These sites are remote, and only lightly maintained by BLM. At each major site, there was an ammo box with archeological information, and some short reminders about Leave No Trace behavior. The first site is just a short walk in, so we had the company of two people while we were exploring the ruin, but the next few sites were devoid of other people. The longer we spent at each site, the more details we noticed that are specific to that area. Sometimes we wouldn’t even notice an additional building ruin, or an additional pictograph until we had already been at the site for an extended time. Split level ruin was my favorite that day; it had a very defined midden filled with really interesting pottery fragments. Between bushwacking and sightseeing, we were moving a lot more slowly than anticipated. Water on this first day was not an issue at first, but as we ventured further into the canyon water became scarcer. 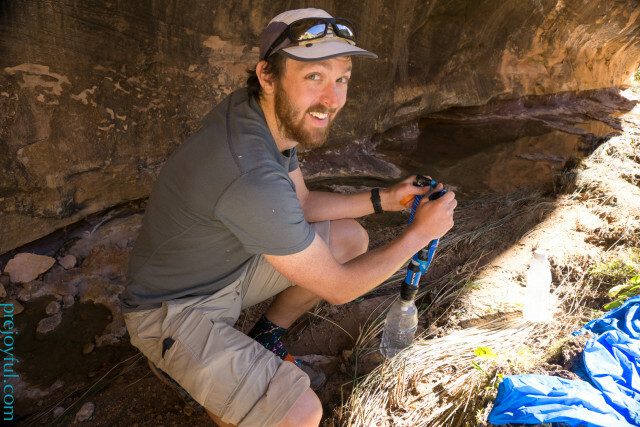 We found a nice seep near the entrance of a small side canyon to refill water, but it took additional time to seek it out and fill up. We ended up needing to camp at the intersection with Coyote Canyon, a few miles before our intended destination. It wasn’t ideal, as it was totally dry, but we found a flat spot under some low hanging trees that wasn’t too sandy. After dinner and bed we listened to all the echoing sounds of canyon wildlife, and tried not to think too hard about all the spider eyes we had seen reflecting in our head lamp light. We headed out early in the morning to try to make up for our lost mileage the day before. 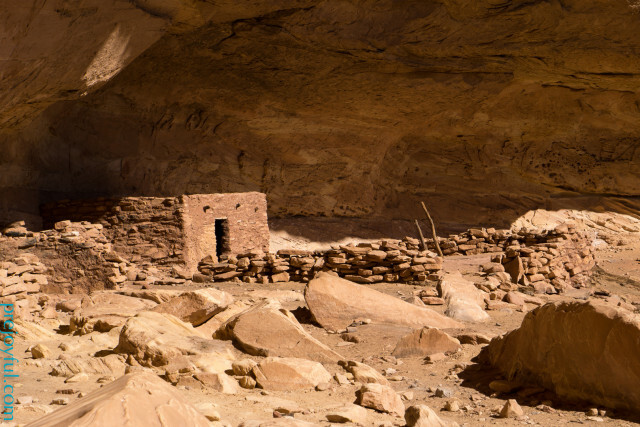 First we walked a short distance into Sheiks Canyon to see the famous Green Mask Ruin. It was a side trip, but well worth it. 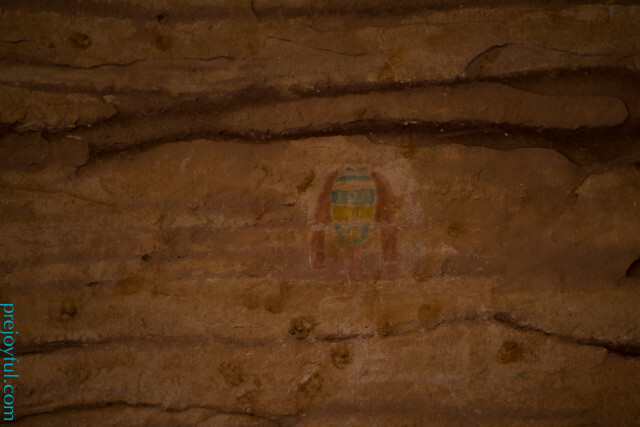 The pictographs were amazing at this site, and it felt like one of the more pristine ruins. We also found plenty of water in Sheiks. We then hiked out to Bullet Canyon, where we immediately came upon more signs of traffic than the main Grand Gulch route. 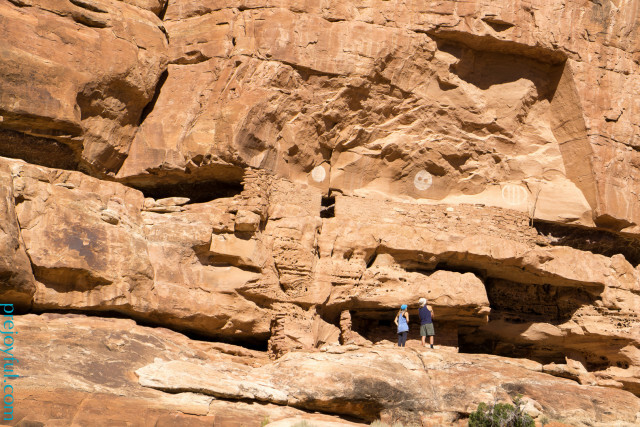 There are some famous ruins along this stretch, accessible from the Bullet Canyon trailhead, including a site where you can climb down into a restored kiva. There was a nicely flowing stream in the first few miles of Bullet Canyon, but then limited water after that. The trail was easier to follow in Bullet, but there is still a convoluted network of use trails that go to each ruin. It’s easy to get turned around or follow a trail or wash in to the brush if you’re not careful. 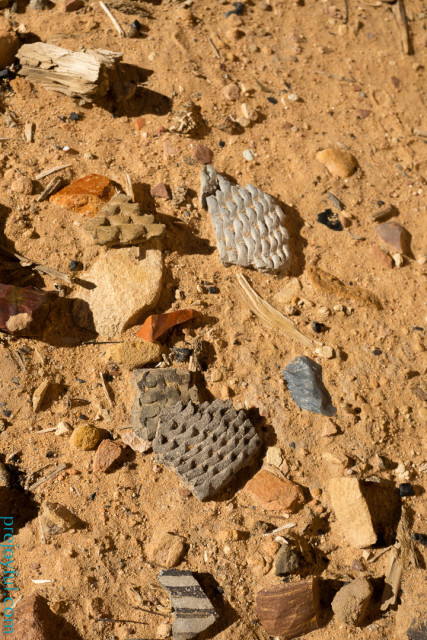 In some ways, not having clear trails to each ruin has increased the overall impact of traffic in this area, and it really feels like BLM should consider marking specific use trails more clearly in order to reduce the overall wear and tear on the desert ecosystem. At one of the sites, we began talking to a nice couple from Colorado. We asked if they had seen any water on the hike into Bullet, and explained our intended route to them. We knew the jeep road hiking would be completely dry, so we needed to fill to capacity (four liters each) while we were in Bullet Canyon. We wanted to carry this weight for the shortest distance possible, so we were hoping for some information on the closest water hole to the trailhead. They had entered from a different route too, though, and didn’t know the water situation higher in Bullet Canyon. However, they generously offered to leave us a few bottles of water from their car at the trailhead for the dry jeep-road portion of our journey. They headed up the canyon before us. We continued our hike out, still spending more time than we had allotted at each ruin. 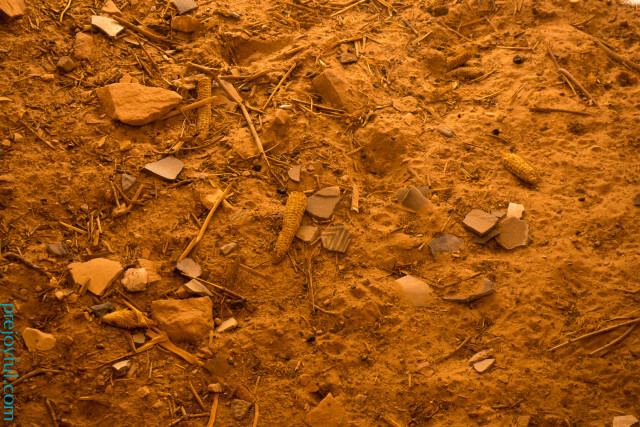 Corn husks and pottery fragments in the midden. 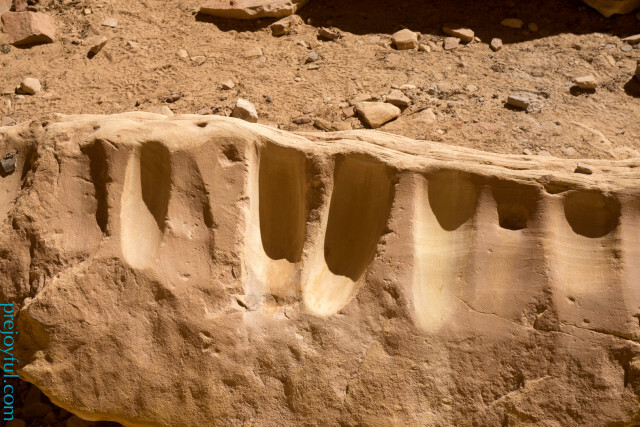 Grinding scars in the sandstone. The Bullet Canyon trail was significantly less washed out, and easier to follow (with cairns) than the Grand Gulch trail, except at one point where the path leaves the canyon bottom to avoid huge snags in a bend in the wash, a turn-off not indicated on our maps. Growing more desperate about our water situation higher in the canyon, we ended up filling from a grimy little pool filled with small shrimp and other swimming wormy things. We double-strained through a bandanna before filtering with our Sawyer filter (which is a wonderful device, incidentally). Then, of course, we found a good water source to fill from a mile or so before we exited the canyon. We were comfortable with the water we had for the plateau crossing, but discovered that our new-found friends had left us water and apples at the parking lot – and had not yet departed! We sat and talked with them about our trip, their weekend adventures, and Colorado for quite a while. We took (and appreciated) the extra water capacity. 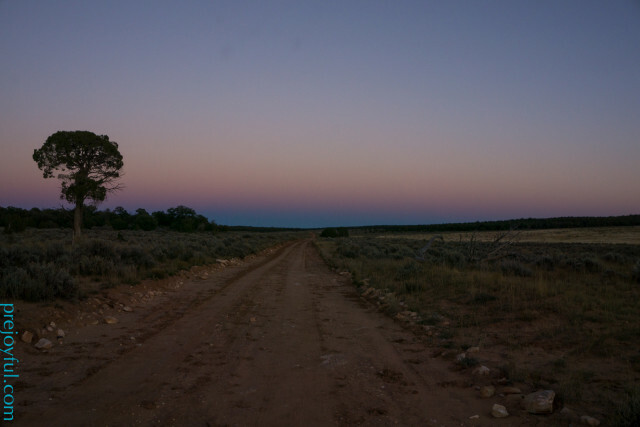 Jeep roads across Cedar Mesa. The jeep hiking was fast and enjoyable at first. The evening was setting up on us, so we didn’t have peak sun beating down on us. But as we walked, we left the area of the canyon, and ventured into cow territory. The plan had been to camp near the jeep roads, and hike down into Grand Gulch the next day, creating a lollipop loop back to the van. I grew less and less thrilled with the idea of camping in cow territory along a dusty, rutted jeep road. There were no designated sites, and the area felt exposed to people and cowboys driving through. I made Joffrey push on long after our usual stopping time, and past our normal dinner hour. After lots of walking we finally arrived at the highway (UT-261). By this time, I was not excited about walking three more miles just to do a parking-lot bivy, and then retrace our route through the brushy canyon the next day. Alternatively, I estimated we had about five miles of highway walking to get to the van. While I was exhausted, getting these five miles done and sleeping in a real bed seemed like a much, much more enticing option. We began the long slog down the road. Luckily there was almost no traffic (one car passed us in five miles), so road walking felt very safe. We fell into the groove of walking fast, and were treated to some amazing shooting stars from the Taurid meteor shower over the next two hours. The day ended up being a total of around 21 miles, and I slept soundly in the van that night. Ultimately, this wasn’t one of my favorite hikes (the actual act of), but I loved seeing the ruins. 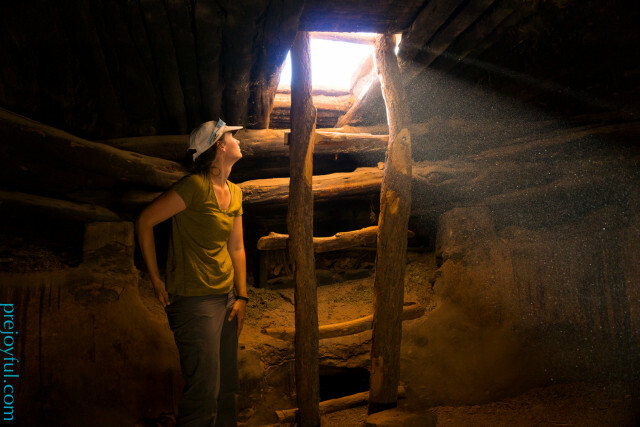 I would definitely go back, especially with a plan to hike the whole length of Grand Gulch, instead of a small section, and I would remember to build an itinerary that includes extensive time for exploring ruins. This history is well worth experiencing, and this is a place where you can experience it up close and relatively unfettered. Many more pictures on Flickr HERE! Lots of pictures of ruins and pictographs!